The whole apartment was very homey and comfortable. The location was perfect! Centrally located. Can walk to all the cultural sites. Beautiful square just outside. Close to coffee shops, stores, shopping. Felt very safe. I liked how clean the apartment was and the location. Beautiful apartment, wonderful view, great location!! The apartment was really charming and beautiful. Not for travelers with extremely high expectations of 5* hotel but this place exceeds our expectations. All the basic listed amenities were there. We thoroughly enjoyed our stay! The property was comfortable, even if access is not easy (many stairs and no lift, so carrying luggage is a pain). Location was great, though a bit long walk from car parking. Apartment was in a beautiful old house and it was easy to find. View from window to the square was nice. One of our best sellers in Venice! 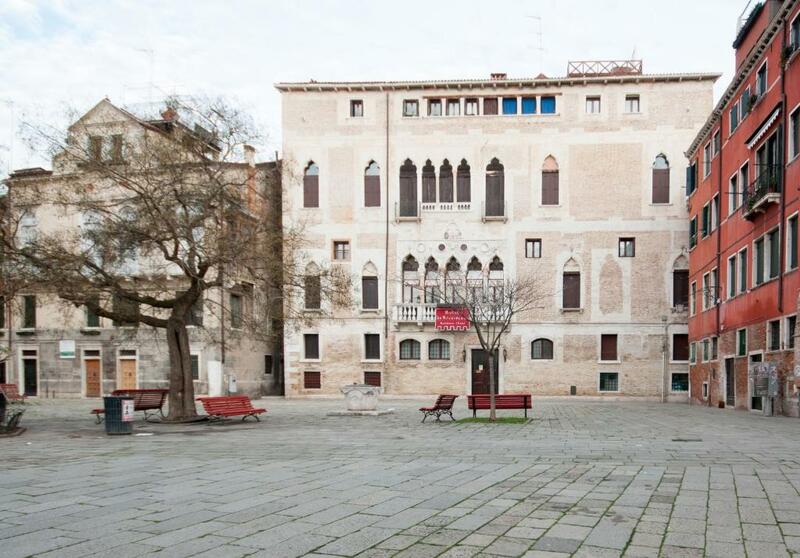 Located in Venice, Doge Morosini Palace has accommodations with a flat-screen TV. Free WiFi is provided. Each unit is comprised of a kitchenette with a dining area and a dishwasher, a living room, and a private bathroom with free toiletries. A microwave and electric tea pot are also offered. Ca' d'Oro is a few steps from the apartment, while The Ducal Palace is a 9-minute walk away. The nearest airport is Marco Polo Airport, 13 miles from Doge Morosini Palace. When would you like to stay at Doge Morosini Palace? This apartment has a oven, dining area and flat-screen TV. This apartment features a seating area, toaster and dishwasher. This apartment features a sofa, stovetop and electric kettle. This apartment has a stovetop, oven and dishwasher. This apartment features a stovetop, dishwasher and electric kettle. The 8 apartments (of different typologies) are located in the historical residence that belonged to Doge’s Morosini Badoer family. it’s a palace of the XIV century that host our best apartments, restored in 2008 with luxury furnishment this apartments give the atmosphere of a Venice that never changed in the time. The apartments are been thought for you that wish to have a wonderful holiday in an all comfort apartment. Every one with an equipped kitchenette, a satellite TV ,free Wi-Fi and self-catering accommodation with views of the city. We are a young and dynamic team aiming at proving you a memorable stay! We are always available, from the reservation, and also during check-in and the stay in the apartment. We meet you at our office in Piazzale Roma to give you the keys of the apartment, offer our wide range of tours and excursions and give you good tips on what to do in our lovely city. Don't hesitate to contact us! The apartaments are located in the Castello district, the most sought after part of the city for visitors seeking the authentic side of Venice, away from the crowded touristy areas. Campo Bandiera e Moro (or Bragora), is a quaint small Venetian square with a ringed well, offering an idyllic view that properly represents the Venice of yore and the city's fascinating “slow” lifestyle. Well served by the ACTV vaporetti, thanks to nearby stops at the Arsenal and San Zaccaria, this apartment is especially easy to reach using public water transportation services along the Canal Grande. It is located is an especially advantageous position for a stroll along the scenic Riva degli Schiavoni, for a visit to the ancient and historic Arsenal, or reach the extraordinary San Marco Square. House Rules Doge Morosini Palace takes special requests – add in the next step! Doge Morosini Palace accepts these cards and reserves the right to temporarily hold an amount prior to arrival. Please note that late check-in is available at a surcharge of EUR 25 from 20:00 until 23:30. From 23:30 until 01:00 late check-in comes at a surcharge of EUR 50. All requests for late arrival are subject to confirmation by the property. The latest check-in hour, even if paying a surcharge, is 01:00. Please inform Doge Morosini Palace of your expected arrival time in advance. You can use the Special Requests box when booking, or contact the property directly using the contact details in your confirmation. Please note that check-in and key collection take place at: SANTA CROCE (Rio Terà Sant'Andrea), 460, VENEZIA 30135. Kitchen could have been better stocked, i.e. with salt/oil etc. Also no dishwasher tablets. It would have been better if we could collect the keys at the venue of the apartment itself because thankfully for me, I was familiar with Venice and the surroundings. But for people who are not familiar, this can be a bit of a small hassle. The host (which is a company) is terrible. It's one of the least customer oriented I've ever seen. They can't help with anything you ask, they just stick to their (sometimes ridiculous) rules. For example: - Keys are not collected at the house, but on the other side of the city, which makes the check-in process very inconvenient. - They hide part of the rate in the form of 'cleaning services', which is something not clearly visible in the room rate when you book, unless you read thoroughly the terms and conditions. So the price you see in Booking.com is not the rate actually, just a down payment. - They charge you to keep the luggage stored part of the day (first time I see this in my life). - You can pay some expenses by credit card, and some you can't (no reason for that). The agent sent an e-mail on the arrival day (!) about the parking facilities and offered a 18eur/day solution. She didn't mention in the e-mail or during our conversation that this offer is available only if I book the parking space in advance. When we arrived to Venice and visited the office, I asked the agent about the discounted parking space and she said that it's available in the Garage San Marco. She said that on the last day of our stay she will stamp our parking tickets which gives us the discount. Well we got 10% off from the 34 EUR daily rate in exchange for the stamp which resulted a really high daily parking fee for the 3 days that we spent in Venice. About the apartman: There was no light in the bathroom, the dining table was unstable, there was no remote control for the TV set (we couldn't switch it on), the shower curtain was broken, there was no light in the kitchen. We spent 630 Eur for two very well located apartments, that are not in perfect condition. Mattress was not comfortable. Paying good money so should not have a terrible mattress. Asked for soap and drain stopper, never received it. Very few towels. Lights didn’t all work. The AC didnt work right away, but it was quickly fixed next day. There is no elevator so it was tough with luggage but i guess its the norm in most apartments in venice.